Every person reaches a critical point once in a lifetime where he has to leave his parents’ home and start his own life. This is a very sharp and unpleasant transition. There are people who never get used to life’s new demands. Today, this same transition is global. Until now, nature led humanity forward, enabling it to succumb to childish, egoistic games. We developed in our egoism and didn’t fight ourselves, but now our childhood is over and our adulthood begins. In the same way that a person reaches adulthood, humanity has ended decades of youth. Our egoism has grown, and now we have to manage in the world on our own. However, the world isn’t what it used to be. We are in a new global and integral world that is mutually connected, and in which we have to find our place and become a part of. We are not children any more. We have grown. Of course, humanity doesn’t want that and doesn’t understand it. Just like a person who reaches adulthood and is suddenly faced with endless problems, he must rent an apartment, go to work, take on different responsibilities, and provide for himself everything that others have provided up until then. Of course, he doesn’t want that. It is much easier and more convenient with mom. It takes time to get used to the grown-up’s world and to find the nice things in it. Humanity isn’t ready yet. It still prefers to dance to the tune of its egoism as before. We are already in the new world, and we have to adapt to it. It demands our full cooperation and concern for everyone, yet people still want to go on playing like kids. They haven’t experienced enough pain to enter the new reality. They should be told that the new world demands our full cooperation, that our work is to connect, and that we will solve all our problems only if we create the right mutual connection among us. The entire world is like one person now. Look at it as if looking in a mirror. If you don’t feel that you are unemployed in certain areas, that natural disasters shock you in other areas, and that still other areas suffer from diseases, look at the general shape of this world. You will see that we have a systematic problem and we all have to be connected to one another, to work together in harmony for one cause, which is general balance. Imagine that you had some medical tests yesterday and the doctor gives you the results today. It turns out that your body’s organs are not operating in harmony, but rather like children. One does too much, one does too little, and one doesn’t do anything at all. After all, balance is the right connection among all the body parts and is the basis for feeling good health. So, now you can come to the right conclusion. In order to get a slight idea of the difference between corporeality and spirituality, imagine that the world is a shop you have entered to buy something for yourself. And next to you there is a shop for newborns where you enter to buy something for your baby. It’s clear that you will feel completely different in that store and will have a completely different attitude to the purchases. You will do it with a thought of bestowal. You will think only about making the other (the baby) feel good because by nature you love him more than yourself. You will always choose what this other one needs with this intention, whether it’s diapers or baby formula. Everything will be aimed only at the baby and how to give him the best possible thing. Maybe you are able to think that way about someone other than your baby, such as your friends, the entire society, or even all of humanity, or perhaps even about the Creator. This depends on the height of your attitude to others. This is the difference of working for your own sake and working for others. It’s just difficult for us to understand what the force of faith means, which lets us feel the importance and necessity of thinking not about ourselves, but about others, something we did not do before. In our world there are examples of that, but they are egoistic and we care about the neighbor only when we feel that we need him. So how can we do the same thing, but against our egoism, above it, and build our attitude to the neighbor upon constant nullification of ourselves? We can understand this when it comes to the people close to us. If we love them, then we even experience pleasure by limiting ourselves for their sake. That is how we measure the force of our love and bestowal: by how much we give to them and take care of them. It is an adult’s obligation to teach a child and to give him all of the necessary preparation for adult life during childhood. And the same thing happens in the spiritual world: The upper level gives the lower level all of the “keys,” all of the means for continuing to build itself. The lower level just has to figure all of this out and make a free choice to keep going. There is nothing else to do but this. All the forces are already at our disposal. Therefore, the small state (Katnut) is considered fundamental, while the great state (Gadlut) is an addition that sometimes appears and sometimes disappears, depending on the efforts of the lower one. But he always keeps the small state, which serves as a good, healthy foundation for creating the next great state, which is new every time. Therefore, the small degree, called Hafetz Hesed (one who desires mercy), fear of the Creator, the level of Bina, “artistry,” or faith, is what has to be transmitted to the next state, from the fathers to the sons, from the upper level of the spiritual ladder to the lower level. Opinion: (Michel Camdessus, former chairman of the IMF, from themarker.co.il): “The world today suffers from two major crises: ecological and financial, and both are caused by one reason: greed for unlimited consumption that destroys the world. In the News (from Daily Mail UK): “A top British businessman is offering a £250,000 reward for an individual to come up a plan for how the euro could be safely dismantled. “The one-off prize is sponsored by Lord Wolfson, chief executive of High Street clothing chain Next and a Conservative party donor, and organised by the Policy Exchange, a think-tank. “The Wolfson Economics Prize, which is a one-off prize, will be the second biggest cash prize to be awarded to an academic economist after the Nobel Prize. My Comment: Certainly no one will be able to create such a plan because for that it is necessary to understand the complexity of our world and its total interdependence in a unified system of global relations. Science does not have such an approach because science is based on human egoistic qualities and is generated by their egoistic protectionist view of the world. The root of the problem of today’s economic science is an egoistic approach to dealing with our world, while it is turning into the world of complete mutual dependence (guarantee). Karl Marx saw it and warned us about this future (communism). However, to this day, no one understands the essence of his teaching. Using the language of economics, he described the future of humanity, a society of mutual guarantee, and its unification as being programmed in our relationships by nature. 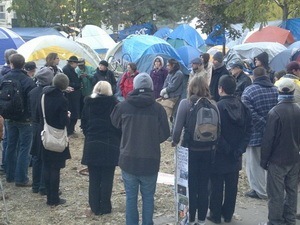 An update from our friends in Toronto: Today the Toronto group once again visited the “Occupy Toronto” tent city. We made a sign stating: “Reality is round like this table, so let’s talk!” One of the movement’s organizers approached us and we started talking. 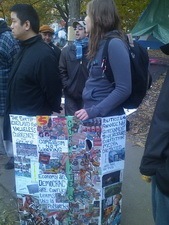 Slowly, more people joined in, forming a large circle of dozens of people. They took turns expressing their demands and discussed different types of unity and the future society. The Toronto tent city is trying to be the model of the future; they are proud of living according to the laws of mutual help and care for each other. A small park in the business center of the city, squeezed between skyscrapers, has turned into a small nation with its own diner, medical station, school, and library, which already has our books. People were saying that when they had left their park and went “into the city,” they were shocked by the society they found themselves in—“all the people hate each other there.” But once they returned to the tent city, they once again found themselves in another world, a world of warmth and care for each other. An update from Wall Street: Saturday was productive as always: We gave out over 5,000 leaflets and gave a forty minute interview for the Chinese TV channel in New York (the largest and most popular television channel for the Chinese living in the US and outside of China). We were interviewed by the channel’s director herself, and it was interesting to talk to her as the interview was on a serious level. We hope that the groups of greater New York (Brooklyn and New Jersey) will also join us. Question: After reading the post “The Influence Of The Environment On Decisions And Memory” I wonder where the concepts of individual integrity and the existential term of living authentically fit into this equation. If you are not certain (are we) of the truth of your perception of memory, how would you be able to determine whether you have made a correct assessment of the choice of friends within social dynamics? Surely I can’t confine my activity to the friends I meet in the Kabbalah seminars? What do I do in my relationship to the people I meet day to day in my ongoing life experiences? Answer: By developing spiritually, we are distancing from everyone who is not involved in this. According to the law of equivalence of form, they cease to be your friends. Question: What is the difference between a screen (Masach) and an intention? Answer: The screen is the true (working) intention. Question: We must choose our words carefully. “I think that YOU should do this” is not the same as, “We would all be better off if we did this.” We should be careful with specifying who is the giver of the information since it makes people feel talked down to sometimes. When people say, “You have not reached it yet, you will know when you do,” it makes them feel bad like the person knows more. This creates resentment. Answer: You are right, but I am a teacher, and this is my language for those who want to learn. Hatred is that broken desire that will be revealed as love in the next moment. It is becoming revealed because the Light shines and influences the desire. However, when there is no Light, a person appears to love everyone, just as many people say. They aren’t lying. They are in such darkness that it really seems to them that it is so, but apparently, we read about righteous people like Rabbi Shimon and his students who were burning with the fire of mutual hatred. How do we understand that? A religious person would say that that is impossible. Aren’t such highly righteous people, pure, all in white garments, incapable of hatred? It is written, “The opinion of the Torah is opposite to the opinion of the masses.” The opinion of the Torah is black and white stripes of rising and falling, and religion tries to keep a person in a state of equilibrium so that everything will be good from one day to another. All my previous experiences won’t help, even though it is written that “There is none so as wise as the experienced.” All of the previous experience were received in more shallow desires with respect to the new desires that are becoming revealed and getting bigger and bigger each time. If I’m under the influence of a stronger desire, experience that I received from a more shallow desire won’t help me. I will hit the wall with my head! Nothing can be done until I determine the full depth of my desire. We only increase the speed of the unfolding and improve our approach to accept every desire as a desired one. It doesn’t matter if it is a good or a bad one; the most important thing is to move forward faster. The number of rises and falls has already been recorded in each desire within each of us according to the root of his or her soul. If you had seen this inner ladder of yours, you would have learned how much you have left to go through at this degree, how much on the next one, and so forth. You are not able to change these steps, only to speed them up. We are not allowed to see them because, in order to work and increase speed, you don’t need knowledge, and, if you knew what you were meant to go through in advance, you wouldn’t be able to overcome that hardship. From your state below, you don’t understand the speed with which you can rise above, which is, simply, the speed of light. Question: Is it possible to cross the Machsom without the knowledge of diagrams and the general system of the Universe? Answer: Yes, it is if your work with friends is directed at true unity. However, you still need to study something to attract the Upper Light to yourself. You should work together with the group, virtually or physically, and study the material, which describes how we are connected. By assembling a Lego set, a child builds his future states, that is, he creates something. We, too, need to create something, and at the same time we need to attract the force that will pull us towards the next level. That is why by trying to unite in the group through studies, we attract the upper Light that unites us, and we begin to understand this scheme namely from connecting. We could not know it, but we should study it together in the group; otherwise, the upper Light will not be manifested. It manifests from those forms in which it exists.